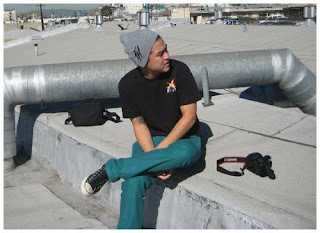 Life After Midnight: The Hundreds Pant and Beanie Preview? The guys at Mighty Healthy snapped this pic of Bobby of the Hundreds recently. First off classic Hundreds style making me wish I had a little more disposable income (or any disposable income). Peek a Boo tee accented by what appears to be a revamped version of the '07 fall Phat reversible beanie and what looks similar to the '07 spring Chino pant in a new colorway similar to what was offered with the Sequel Cargo Short. Possibly a preview of whats to come out of the Hundreds camp.